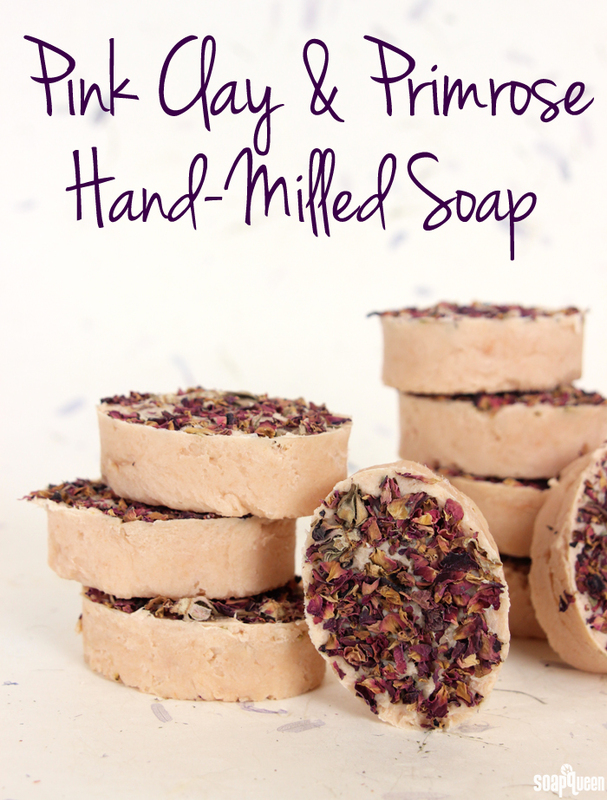 Hand-milled soap is a fantastic option for crafters who prefer not to work with lye, but still love the look and feel of cold process soap. Hand-milling (also called rebatching) involves melting down pre-made cold process soap and adding a small amount of extra liquid. 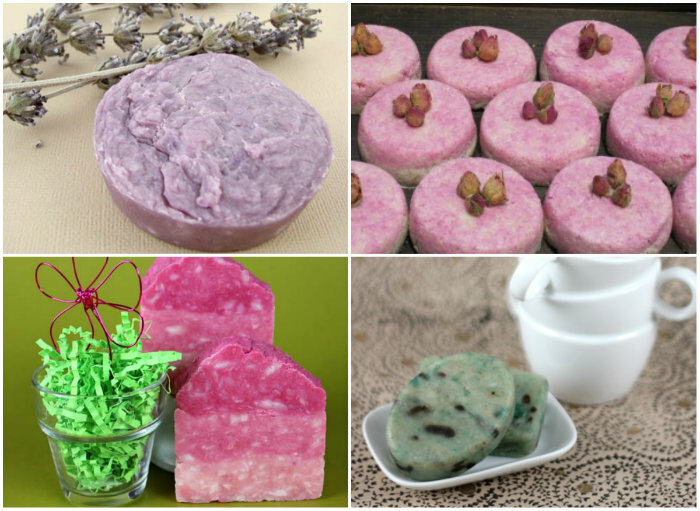 If you’d like to see this process in action, check out this How to Make Rebatch Soap video on Soap Queen TV. 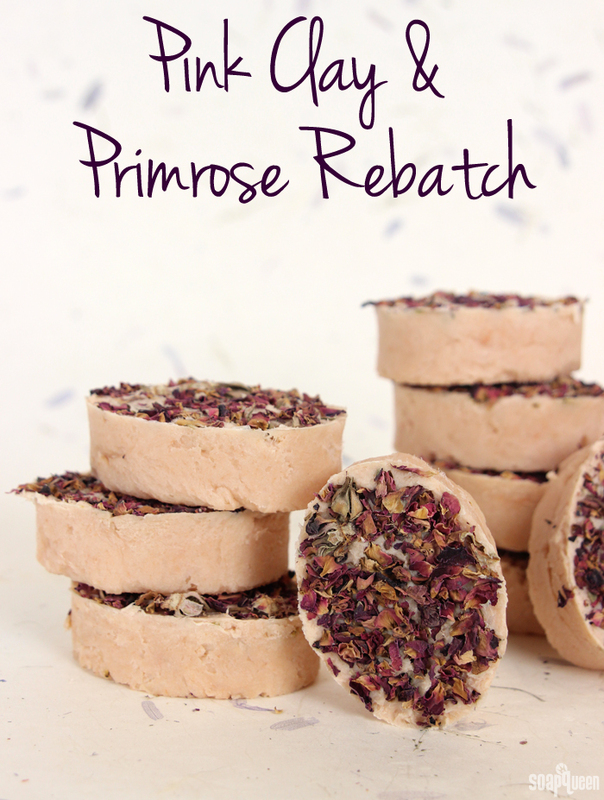 For this recipe, rose water is used with pink Brazilian clay to give a light rosy hue. 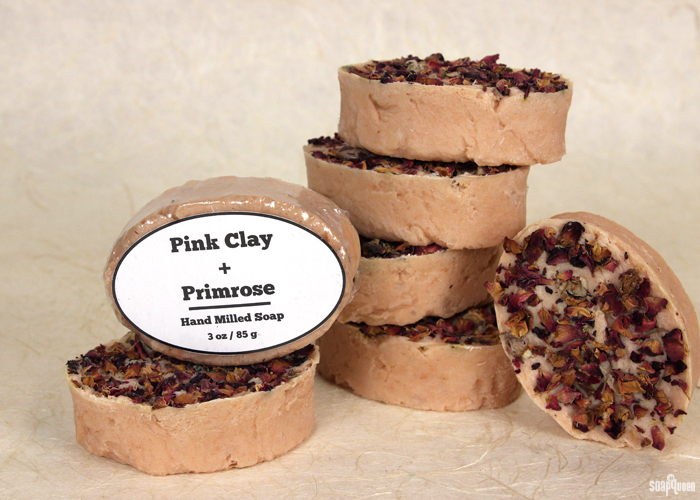 Topped with rose petals and scented with Ylang Ylang III essential oil, this Pink Clay & Primrose Hand-Milled Soap project is wonderfully feminine. This project would make a great gift for Valentine’s Day! These downloadable labels make packaging and giving to loved ones easy. COLOR PREP: Disperse 1 tbs. Pink Brazilian Clay with 1 tbs. rose water. Use a mini mixer to get clumps worked out smoothly. The clays tend to sink to the bottom of the container, so be sure to give them one final mix right before you add them to the soap. 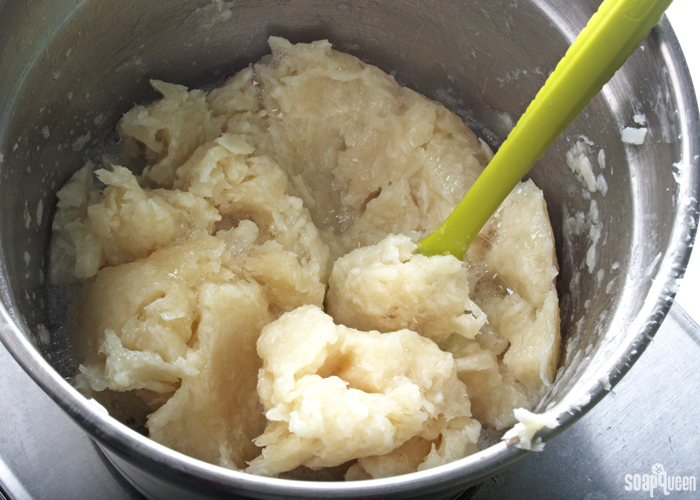 ONE: In a crock pot or double boiler, heat the rebatch and 4 ounces of rose water over medium heat until it reaches the consistency of mashed potatoes, stirring frequently to ensure the soap heats evenly. Add additional small amounts of rose water if needed. TWO: Add all of the pink Brazilian clay mixture into the soap, and use a spatula to stir in and fully incorporate. 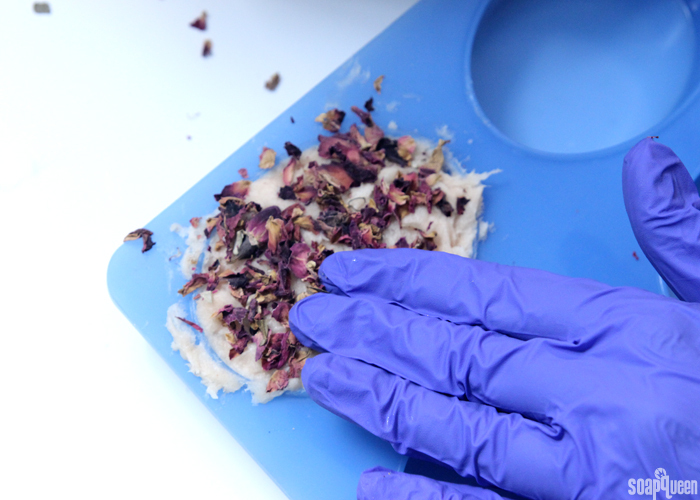 THREE: Add the Evening Primrose Extract and Ylang Ylang III Essential Oil , and use a spatula to fully incorporate. 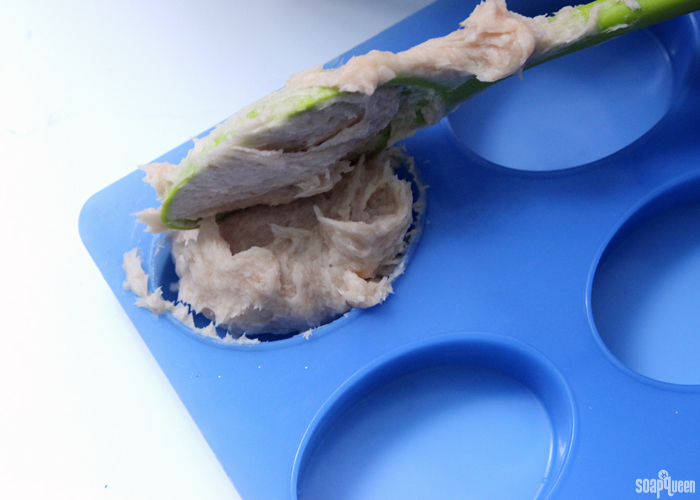 FOUR: Once all additives are fully incorporated, use a spatula to scoop the soap into the mold cavities. Using your hands or the spatula, press the soap into the mold to eliminate bubbles and air pockets. Tip: Cover the soap with a piece of plastic wrap while you are pressing the soap into the mold to reduce the mess! 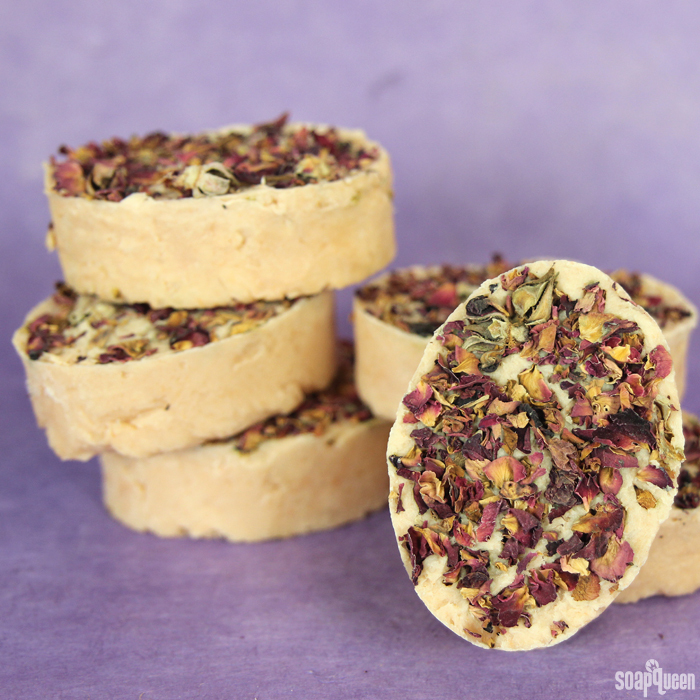 FIVE: Sprinkle rose petals on the top of the soap, and use your fingers to gently press them into the rebatch to ensure they adhere. SIX: Once all the cavities are filled with soap and topped with rose petals, allow the soap to stay in the mold for 5-7 days. Once it is firm enough to remove, allow the soap to cure for several more days. This allows the moisture to evaporate, creating a harder and longer lasting bar. Have you started your Valentine’s Day projects yet? Keep your eyes on the blog next week for a sparkly Valentine’s Day melt and pour project! Disperse 1 tbs. Pink Brazilian Clay with 1 tbs. rose water. Use a mini mixer to get clumps worked out smoothly. The clays tend to sink to the bottom of the container, so be sure to give them one final mix right before you add them into the soap. In a crock pot or double boiler, heat the rebatch and 4 ounces of rose water over medium heat until it reaches the consistency of mashed potatoes, stirring frequently to ensure the soap heats evenly. Add additional small amounts of rose water if needed. Add all of the pink Brazilian clay mixture into the soap, and use a spatula to stir in and fully incorporate. 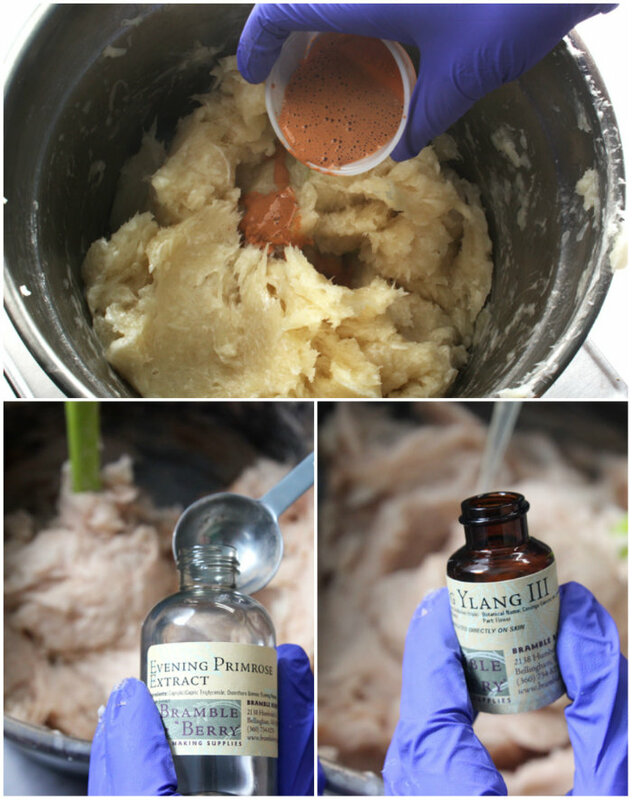 Add the Evening Primrose Extract and Ylang Ylang III Essential Oil , and use a spatula to fully incorporate. 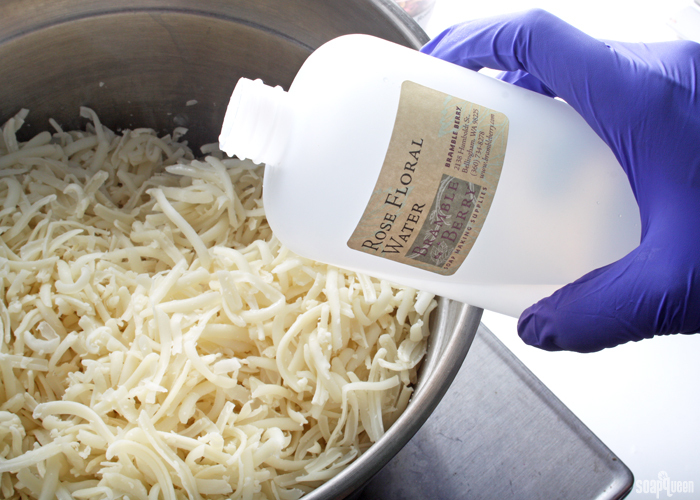 Once all additives are fully incorporated, use a spatula to scoop the soap into the mold cavities. Using your hands or the spatula, press the soap into the mold to eliminate bubbles and air pockets. 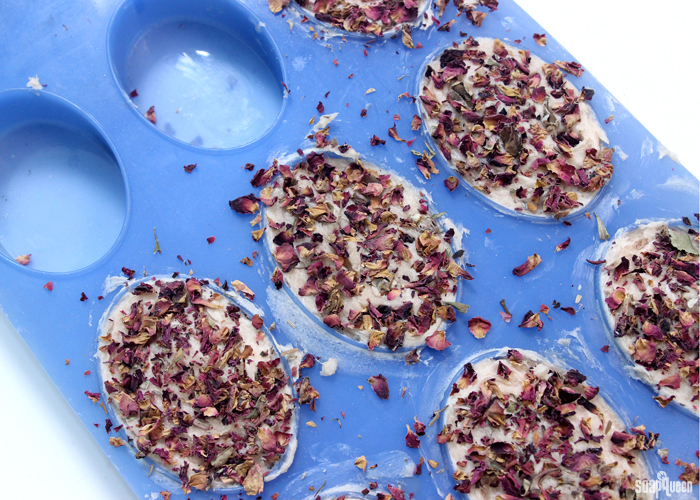 Sprinkle rose petals on the top of the soap, and use your fingers to gently press them into the rebatch to ensure they adhere. Can I use a loaf mold instead of the oval molds? Where can I store the soap while I wait for the few days? also, can I add other essential oils or other flowers? I live in the PNW and I seem to have these unique flowers that I sometimes like to use in floral waters. Do you have a recipe for that? Also, I don’t have soap to rebatch, can I use melt n pour? You can make this recipe with melt and pour, but it will look quite a bit different! I wouldn’t recommend adding rose water to the recipe. You can add about 1 teaspoon of the extract per pound of soap. As for the rose petals, they don’t stick to the top of melt and pour very well. You can add them to the soap, but keep in mind they will eventually go brown. Hi, I love this soap! I have some cold-processed soap that isn’t cured yet can I use that or do I have to wait the whole 4-6 weeks before I can re-batch it?